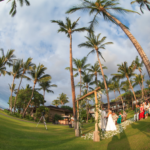 Holly and Andrew were married at the Four Seasons Hualalai on the Big Island of Hawaii. Wedding Tree was the iconic location that they chose to have their ceremony and then used the rest of the resort for wedding portraits afterwards. 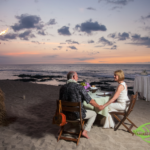 The couple came from England for their Big Island wedding. They celebrated back in England by showing their wedding images and video at a reception. They kept all the images under wraps until the big reveal at the reception. 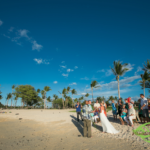 This wedding was photographed at Kikua Point, sometimes referred to as Kukio Beach, on the Big Island of Hawaii. The wedding was a Vintage and Lace wedding with Rachel H.
The couple had the ceremony right on the beach. They brought in some chairs and then had the rest of the guest stand. The ceremony was scheduled about an hour and a half before sunset giving the couple an hour for photographs after the ceremony. They ended their photos in the water at sunset.